What Is A Glucometer ? A glucometer is a medical device which measures the concentration of sugar (glucose) in human blood. A glucometer is an equipment for home blood glucose monitoring (HBGM) by people with Type 1 or Type 2 Diabetes Mellitus. Glucometer provides rapid results, allowing the diabetic patient to know whether their glucose level is higher than desired, lower than expected, or within an acceptable range of levels. There are many different brands and models of glucometers which vary in size, function and ease of use. 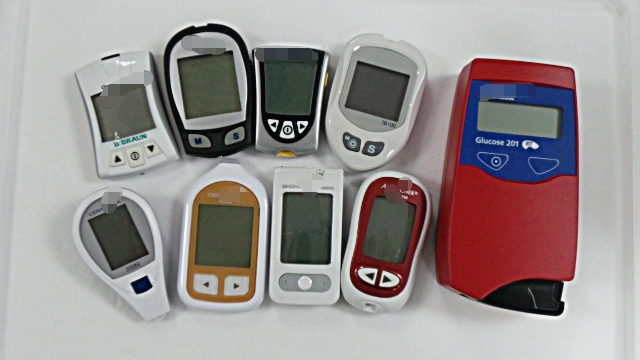 For a person who is just starting to use a glucometer, it is important to use them correctly despite the ease of use. A wrong glucose result maybe harmful. 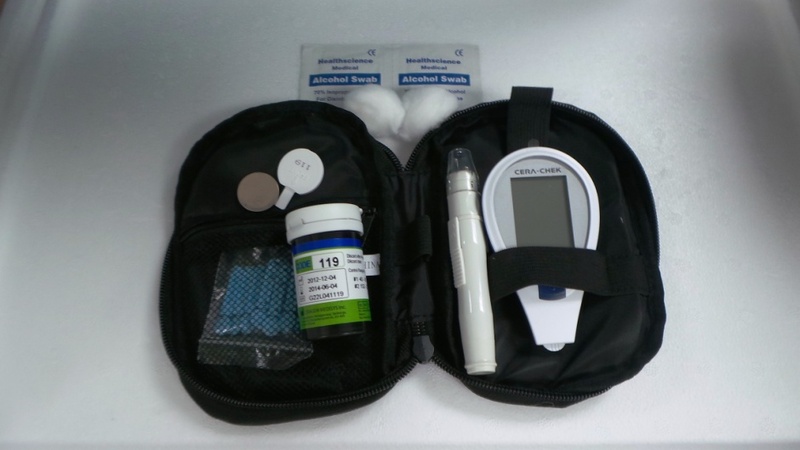 Gather all necessary materials before starting : Glucometer; test strips, alcohol swab and lancet. Make sure the glucometer has working batteries installed and on a flat surface. Open the bottle of test strips or remove strips from aluminium foil if strips are individually packed. Insert the new strip into the unit. Wash your hands or use an alcohol swab to clean your finger. If you are using alcohol, let it dry before you prick your finger. 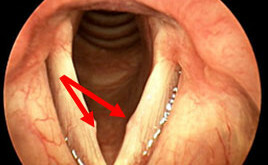 Use a new lancet to prick the side of a fingertip which is less painful. Turn on the glucometer (some model will start automatically once test strip inserted in). Confirm test code number appeared on display same as the coding on the current test strips packing. The glucometer reads your blood sugar level in seconds. Record the reading of your blood sugar in a notebook as a reference for yourself and your doctor. Some meter have large memory to store blood sugar readings. Always keep extra batteries, test strips and other supplies. Warm up the hands before using the lancet to make the prick hurt a little less and to create a better blood flow. After pricking and obtaining the blood, apply pressure on the wound with a paper towel / a tissue / dry cotton to stop the flow. Alternating fingers for multiple tests prevents the tips of the fingers from becoming sore. Lancets are meant for single use only. 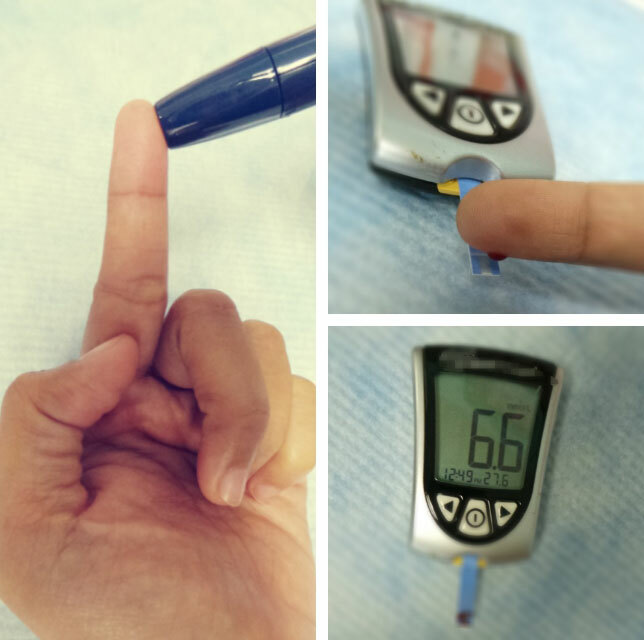 What Is The Meaning Of Blood Glucose Levels? Blood glucose levels indicate when there is too much glucose circulating through your blood (hyperglycemia) or when there is too little (hypoglycemia). Hyperglycemia may be caused by pregnancy, kidney disease, liver disease or an inflamed pancreas. Hypoglycemia may be attributed to problems with the thyroid or adrenal glands. It may also show that you’re not consuming enough food. Cost: Glucometers vary in price and be sure to factor in the cost of test strips as they are the most expensive part of monitoring for they’re used so often. Individually packaged strips may cost more, but you might not use all the strips in a container before the expiration date. Figure out which type of strip is most cost-effective for you. Size: Average size is approximately the size of the palm of the hand, though some may as small as a pen or larger, and battery operated. Ease of use and maintenance: Some meters are easier to use than others. Can you easily see the numbers on the screen? How easy is it to get blood onto the strips? Does it require a small or large drop of blood? Also, some brands of meters need to be coded and others have no coding. Test strips: Each strip is used only once and then discarded. Some can detect or measure beta-hydroxybutyrate in the blood (blood ketone) to detect diabetes ketoacidosis (DKA), a complication of hyperglycemia. Coding: Test strips may vary from batch to batch. Some glucometer models require the user to manually enter in a code found on the vial of test strips or on a chip that comes with the test strip. The meter will be calibrated to that batch of test strips by entering the coding or chip into the glucometer for accurate results. Certification : Choose glucometer/glucometer strips with equivalent CE marking, FDA approval or ISO accreditation. Volume of blood sample: The quantity of blood required may varies from 0.3 to 1 ?l. Smaller volume requirements reduce the frequency of unnecessary pricks. Measurement times: The time it takes to read a test strip may range from 3 to 60 seconds for different models. Display: The preferred measurement unit varies by country: mg/dl are preferred in the U.S., France, Japan, Israel, and India. mmol/l are used in Canada, Australia, China, Malaysia and the UK. The glucose value in mg/dl or mmol/l is displayed in a small window. Glucometer users are recommended to use SI unit (mmol/l) in the glucometer settings. Clock/memory: Some meters now include a clock that is set by the user for date and time and a memory for past test results to enable user to keep a record of management and look for trends in blood glucose monitoring. Users often do not set glucometer to the correct time; and therefore misrepresent the time of the past test results and complicate the management of blood glucose patterns. Special features: Ask about the features to see what meets your specific needs. For example, some meters are large with strips that are easier to handle. Some are compact and easier to carry. People with impaired vision can buy a meter with a large screen or a “talking” or audible meter that announces the results. Colorful meters that give a quick reading are available for children. Some models have a backlight, which is handy for urgent nighttime readings. Support. Many glucometer manufacturers include a toll-free number on the back of the meter that you can call for help. Look for a meter that includes clear instructions that demonstrate the correct way to use the meter. Some manufacturers offer user manuals on their websites. Each glucometer should come with an operating manual for error codes and troubleshooting problems. Otherwise, call for manufacturer toll-free support service. There are common problems and troubleshooting issues that arise with frequent use which can lead to inaccurate readings. Understanding how your glucometer works and what can affect the results it gives can help to prevent problems. Battery: Low battery may cause unreliable blood-glucose readings. Control solution:May give false high or false low results if they are stored at extreme temperatures, used after the expiration date or contaminated via a cracked bottle or storage without the cap secured. Please consult manufacturer if in need for the solution. Calibration: Accuracy is dependent on calibration done. Incorrect coded meter can be dangerous for home blood glucometer users as this may increase risk of hypoglycemia. Test Strips: Test strips contain chemical which react with the blood and measure the blood glucose. Place in suitable temperature recommended and do not use beyond expiry date. Blood sample site other than the fingertips. H.Peter Chase MD, Rosanna Fiallo-Scharer MD, Chapter 7: Blood Sugar (Glucose) Testing. Monitoring Diabetes (Testing Blood Sugar) Pg 49-64.